Magens Bay St Thomas USVI estate SOLD by Platinum Luxury Auctions! SOLD BY PLATINUM FOR THE 3RD-HIGHEST PRICE IN ST. THOMAS, USVI HISTORY! Situated on one of the finest pieces of residential real estate on St. Thomas, this contemporary estate offers sublime, 180-degree views of world famous Magens Bay and its 300 acres of surrounding Nature Conservancy land. The stepped design of the property allows the residence to blend in with its lush surroundings, and provides for a graceful descent to its private access beach and the sparkling waters of Magens Bay. A gated guardhouse entry and an 8-foot high concrete perimeter wall ensure peace and privacy at the estate. Interiors of the multi-structure compound feature Balinese themes accented by exotic Indonesian sculptures and tasteful artwork. With 9 spacious bedrooms, 9 full and 2 half baths, and 15,000 square feet of living space, the residence can accommodate a fairly large family or group of friends and associates. Main living areas offer lofted ceilings and sliding glass doors. There is also a gourmet kitchen with center island, a billiards room, fully equipped gym, and large dining and living salons. Outdoor living areas of the estate are equally impressive, and include features such as a “Zen” garden patio, plentiful landscaping and planters, a central pavilion, and a beach bar with outdoor dining and lounge areas. There are also 2 pools – a smaller and more private pool on the upper level, and a large, oceanfront pool on the lower level that offers sweeping views of Magens Bay. In the evening, the pool’s surrounding fire torches provide a festive glow after the sun goes down. An excellent environment for relaxed, Caribbean living! 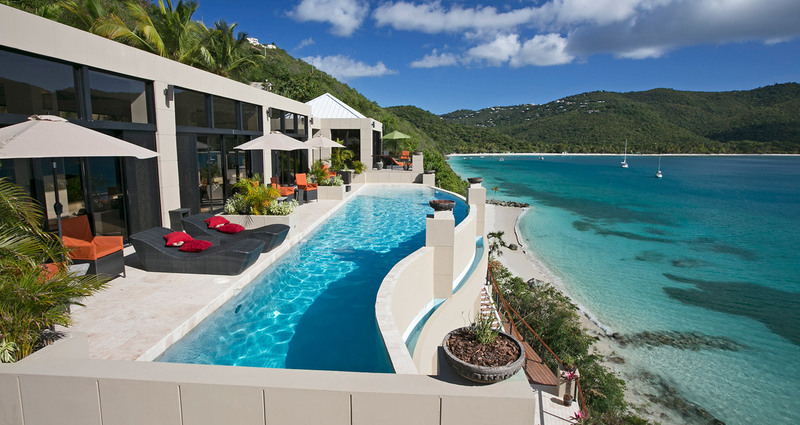 Property sold in cooperation with United States Virgin Islands Sotheby’s International Realty. Listing Agent Lee Steiner. Sotheby’s International Realty, the Sotheby’s International Realty logo and affiliate logos are registered (or unregistered) service marks used with permission. Neither Sotheby’s, Sotheby’s International Realty Affiliates LLC, nor any of their affiliated companies is providing any product or service in connection with this event other than as required by applicable law.